until 1944 and served on every front that the German army fought in. 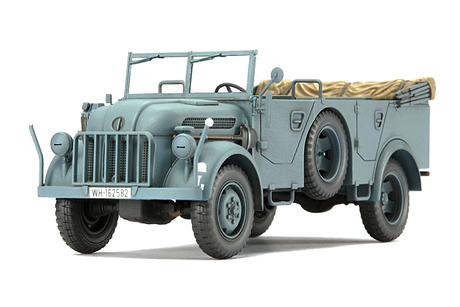 This is a finished model of the 1/48 German Steyr 1500A/01. Open passenger compartment and distinctive hood shape accurately reproduced. Rugged suspension system realistically recreated. You are able to display your model as it is, once removed from its cube shaped box. finish of the Steyr Type 1500A/01. Special spin-cast parts add to the feeling of weight to the Steyr Type 1500A/01.